Dame Sarah Storey will bid to break the women's Union Cycliste Internationale hour world record in February 2015. Great Britain's most decorated female Paralympian will be the first woman to take on the equivalent ladies' race since a UCI rule change in March. The existing record of 46.065km was set in 2003 by Dutch rider Leontien Zijlaard-van Moorsel. Germany's Jens Voigt and then Austrian Matthias Brandle broke the men's record earlier in 2014. "I'm excited and nervous at the prospect of being the first woman to take on the record in over a decade," said Storey. Austria's Brandle set a new hour world record of 51.850km at Switzerland's Aigle Velodrome in October, breaking Voigt's previous record mark of 51.115km set a month before. The Hour Record is the blue riband event for track cycling, and is a record that has recently enjoyed something of a renaissance after the UCI changed its rules about the use of aerodynamic equipment. Storey's attempt will take place on Saturday 28 February during round five of the Revolution series, being held at the Lee Valley VeloPark, which was used during the London 2012 Olympic Games. UCI president Brian Cookson welcomed Storey's attempt: "After two UCI Hour Records in quick succession for the men, I am very pleased the existing women's record will now be challenged. "Dame Sarah Storey's attempt will be eagerly awaited and I am sure it will prompt other top women riders to try to claim this prestigious record." 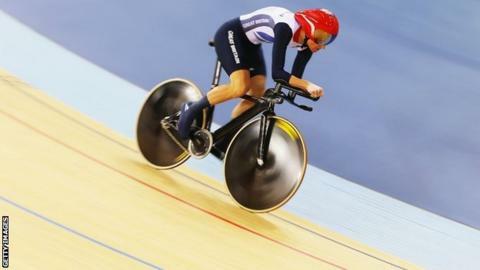 In addition to Storey's attempt, Sir Bradley Wiggins, 34, confirmed to BBC Sport he will try to break the men's record next year.